(These are a few of ancestor names from that have been identified as having had CCM1. We will continue to add to this list as others are identified. Those directly descending from these grandparents would possibly be at higher risk of inheriting CCM1). The story of the Camino Real de Tierra Adentro has the ability to cross generational lines, and nearly 417 years later, its stories and impact on the settlement of New Mexico continue to fascinate and inspire people of all ages. Many people throughout the southwest are familiar with the story of the Camino Real and the promises of a better life and riches to the early settlers who traversed the 1500-mile trek from Mexico City to Ohkay Owingeh. But few have knowledge of the impact of the medical mysteries that accompanied the travelers and settled itself into many modern New Mexican families. Long before the Spaniards arrived in New Mexico through the Camino Real, the Royal Road, this route was being used by Native Americans as a trade road for salt, hides, minerals, turquoise, and pottery. The same route was used by Juan de Onate in 1598 for his expedition into our part of the southwestern desert and again by Diego de Vargas in 1692.
your family, your ancestors, leaving behind everything they knew about their homes in Spain or Mexico and joining one of the expeditions to this remote and isolated land. Illness and death were a frequent occurrence through infections, accidents, or other sicknesses. The founding families of New Mexico were many. Only the strong ones survived and completed the journey that took 4 to 6 months. In 1600 Capitan Cristobal Baca, his wife Ana Maria Pacheco and their family came to New Mexico as reinforcement with Don Diego de Vargas for the newly established colony brought by Juan de Onate in 1598. This couple was the progenitors of the Baca & C’de Baca Families living New Mexico and the Southwest today. 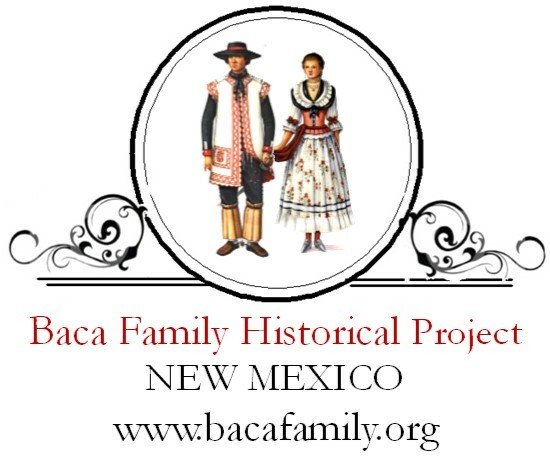 Well established New Mexican families and the Baca and C’de Baca are some of the families who can trace their ancestry back to Cristobal Baca, one of New Mexico’s first settlers. Abeyta, Anaya, Aguero, Aguilar, Alarid, Alderete, Alire, Apodaca, Archuleta, Aragon, Armenta, Armijo, Atencio, Avila, Baca, Bernal, Benvides, Blea, Borrego, Brito, Bustamante, Bustos, Candelaria, Cardenas, Carrillo, Casados, Casillas, Casias, Chacon, Cháves, Contreras, Cordoba, Crespin, Cruz, Delgado, Dimas, Domínguez, Durán, Esquibel, Fajardo, Febro (Febre), Fernandez, Flores, Frésquez, Gabaldon, Gallegos, Galvan, Ganoa, García, Garduno, Guerrero, Gómez, González, Griego, Gurule, Gutiérrez, Herrera, Hurtado, Jaquez, Jaramillo, Jiron (Giron), Labadie, Lara, Larrañaga, Leyba, Lobato, (Lovato), López, Lucero, Luján, Luna, Maldonado, Machego, Madrid, Maese, Manzanares, Mares, Márquez, Martín (Martínez), Mascareñas, Medina, Mestas (Maestas), Miera, Mirabal, Molina, Mondragón, Montaño, Montoya, Mora, Morán, Moya, Muniz, Naranjo, Nieto, Noanez, Nunez, de la O, Olguín, Oliva, Olona, Ortega, Ortiz, Otero, Pacheco, Padilla, Peña, Pineda, Pino, Perea, Prado, Quintana, Ramirez, Rendon, Ribera (Rivera), Rodarte, Rodriguez, Romero, Roybal, Saavedra, Sáez, Salazar, Salas, Sánchez, Sandoval, Santillanes, Santiseban, Sedillo, Segura, Serna, Sierra, Silva, Sisneros, Solano, Suazo, Tafoya, Tapia, Tenorio, Torres, Trujillo, Ulibarri, Urioeste, Valencia, Valenzuela, Valdez, Valerio, Varela, Velarde, Velasquez, Virgil, Villalpando. “Along with the new tools and animals such as horses brought by the Spaniards to the new world came other more quiet, unseen, and unknown contributions such as disease and genetic mutations. The Spanish brought with them smallpox and measles which nearly decimated the native American populations from Mexico northward, up through the Camino Real de Tierra Adentro into what is now New Mexico.” (New York Times, September 2007). “Shared Hispanic heritage with French, Jews, and Spaniards bring a burden of having forebears with genetic diseases that, like the remote mountain villages in this region, have remained largely hidden from medical diagnosis and treatment. One of these diseases is cerebral cavernous angioma. A cavernous angioma is an abnormal blood vessel in the brain or spinal cord, shaped like a mulberry, that can hemorrhage or grow. It can cause stroke symptoms or seizure in both children and adults. Based on genealogical research, we believe the family line of Cristóbal Baca, his wife, Ana Maria Pacheco Ortiz through their grandson, Cristobal Baca II & Ana Moreno de Lara Trujillo were the original carriers in New Mexico. Today there are tens of thousands of individuals related to the original founders who are now living with what we call the Common Hispanic Mutation (CHM). Because of geography, the original families of New Mexico tended to stay in the area, and we have found more affected families in northern New Mexico and southern Colorado than anywhere else in the world. Each year more children are born with CHM. Because families go undiagnosed. However, symptoms of the illness are widely variable, and it wasn’t until 1995 that the shared gene in this population was identified. Since then, the University of New Mexico has been the center of research to understand the features of the illness in this group. Angioma Alliance, the University of New Mexico, the University of California San Francisco, and the Barrow Neurological Institute are partners in a 10-year consortium project to understand the natural history of the illness and look for factors that could account for differences in severity of the illness even within the same family. New Mexico’s Hispanic population is unique. Their bloodlines aren’t traced to Mexico; instead, they descend from Spain’s Hispanic conquistadors that colonized the region. Dr. Leslie Morrison, UNM neurologist, suspects there are thousands of people in the state that have the disease, many of whom are undiagnosed. And since the Southwest has the only known large cluster of this disease, Morrison says the likely reason is that CCM originated in the New World as a result of one Hispanic couple. As a result of Dr. Leslie Morrison’s research, in 2017, Angioma Alliance began the Baca Family Historical Project ( a working title) to find and connect descendants of Cristóbal Baca and Ana Maria Pacheco Ortiz. It is a community outreach program designed to bring together families with the Common Hispanic Mutation across New Mexico through genealogy with the goal of creating a supportive community among this historical extended family. To identify descendants of Cristobal Baca and his wife Ana Maria Pacheco Ortiz believed to be the progenitors of the Hispanic genetic mutation causing cerebral cavernous angioma. To connect and educate affected families with others experiencing the same issues and provide resources for them to make informed decisions about their medical care. To lead outreach efforts in high-risk communities throughout New Mexico, social media and in-person events. To sponsor community gatherings at schools, community centers, and fairs. Photo: Map of New Mexico indicating areas of populations with large concentrations of Common Hispanic Mutation. Cerebral Cavernous Angioma continues to make the news in New Mexico and across the country as more mystery is removed from this disease. This Baca Family Tree shows the CHM gene in genealogist, Joyce Gonzales’ family. Not everyone in the family tree has the CHM gene. This tree only shows the family members who have been identified, with their permission.